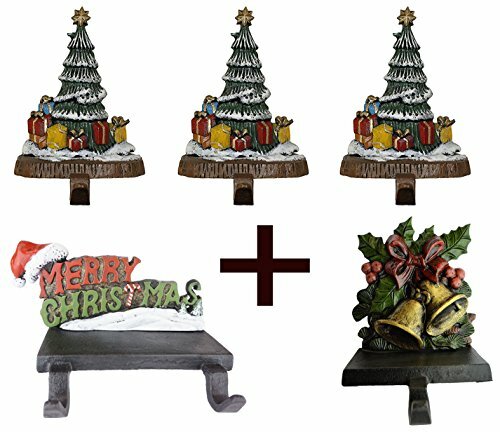 Lulu decor, combo deal of stocking holders includes five cast iron pieces with 6 stocking hooks, comes with 3 christmas tress, one base of merry christmas with two hooks and one bell hook. Made of Cast Iron, solid, heavy & beautiful hooks especially crafted for the occasion, enjoy it for years to come. Hand Made and Hand painted in christmas colors by our skilled craftsmen, these products are exclusively made by Lulu. Create a festive charm with these decorative mantel stocking holders, great buy! Perfect for holiday gift, Christmas gift, will be adored by family and friends. Lulu decor, Combo Deal of stocking holders includes five cast iron pieces with 6 stocking hooks, comes with 3 christmas tress, 1 Merry Christmas with two hooks & 1 bell hook. 100% Cast Iron product, solid, heavy & beautiful hooks especially crafted for the occasion, enjoy it for years to come. 1 stocking holder weighs approx 3 lbs. Create a festive charm with these decorative mantel stocking holders, great buy!